There is a great opportunity to bring Higher Divine Consciousness to our world and to intervene in the karmic suffering of people. Dr. Pillai has commissioned the establishment of several deities at his Temple and Homa Center in Southern India. In ancient times, establishing deities on earth were the responsibilities of the Kings and Queens, working hand in hand with great seers and yogis. They could only inaugurate Temples and Deities at certain times. It was considered a great failure to not be able to do it in one’s lifetime. In modern day times, this duty now rests on those who have both the higher awareness and established capabilities to influence society for the betterment. Dr. Pillai has waited for this time and now selects the establishment of 2 Primary Deities to be stationed in our Chennai Temple. Be alert to this date for this year: August 14, IST is Aadi Amavasya. Connect with your ancestors as they are willing to help you grow and enjoy good health, peace and prosperity. Participate in the Sponsorship level deity establishment rituals. The sponsorship level includes complimentary participation in the Kumba Abhishekam day rituals which will be performed in the month of August. It also includes 6 months of poojas to Lord Nataraja and Sivakami (Parvati). Your name will also be added on a plaque at our homa center. We invite you and your family to help lay the foundational stone for coming generations and to establish a new consciousness in this world. The merit of establishing a deity and bringing it’s energy into this world garners immense boons from that deity. Establishing a Deity with purity of thought, blesses you not only now, but in future lives. Even more important, the Deity, which is the static form of God, will bless countless number of people who seek sanctuary for generations to come, long past our time on this earth. With sincere prayers and service to the Divine and to Dr. Pillai, we invite you to be a part of this unique opportunity to bring the Gods and Goddesses into our World. Note: Your prasad will be shipped after the Kumba Abhishekam day rituals. Please allow 2 – 4 weeks for delivery after the rituals. Participate in the Patron level deity establishment rituals. The Patron level includes complimentary participation in the Kumba Abhishekam day rituals which will be performed in the month of August. It also includes one year of poojas to Lord Nataraja and Sivakami (Parvati). Your name will also be added on a plaque at our homa center. We invite you and your family to help lay the foundational stone for coming generations and to establish a new consciousness in this world. The merit of establishing a deity and bringing it’s energy into this world garners immense boons from that deity. Establishing a Deity with purity of thought, blesses you not only now, but in future lives. Even more important, the Deity, which is the static form of God, will bless countless number of people who seek sanctuary for generations to come, long past our time on this earth. 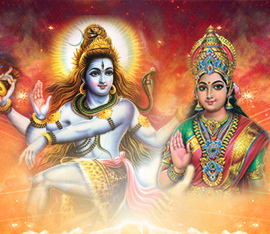 With sincere prayers and service to the Divine and to Dr. Pillai, we invite you to be a part of this unique opportunity to bring the Gods and Goddesses into our World. Note: Your prasad will be shipped after the Kumba Abhishekam day rituals. Please allow 2 – 4 weeks for delivery after the rituals.